Bhubaneswar: A 20-year-old girl from Odisha's Kalinganagar has been selected to be part of a team that will trek to Mount Everest in Nepal. Swarnalata Dalai's mountaineering skills while participating in the first edition of Biju Patnaik Himalayan Expedition had impressed an adventure group, which eventually signed her up. "I am very excited to be a part of the Mount Everest expedition. 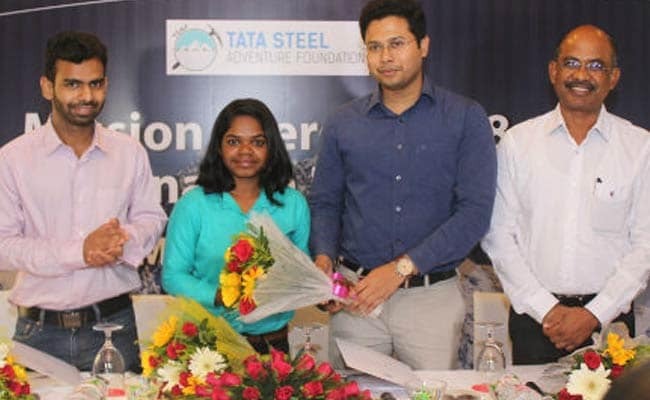 I am grateful to our state government, Tata Steel and Tata Steel Adventure Foundation for placing their trust and confidence in me by providing such a huge opportunity," Ms Dalai said. For "Mission Everest 2018", three candidates -- Swarnalata Dalai, Poonam and Sandeep Toliya - have been trained under the foundation's adventure programme chief Bachendri Pal. They will leave from Delhi for Kathmandu on March 27, and then proceed toward the Mount Everest base camp. "We are proud of Swarnalata and would like to congratulate her for being selected in the team to trek Mount Everest," said Chanchal Rana of the Odisha Department of Sports and Youth Services. Trekking on Mount Everest is a difficult task. Climbers must be in top shape in order to withstand any obstacles that the harsh environment may throw at them. The foundation says it regularly conducts trekking programmes and expeditions to peaks across the world. Ms Dalai has participated in other expeditions such as the Roopkund trek in Garhwal, considered one of the toughest treks. "We at Tata Steel would like to thank the Odisha government for providing us with continuous support for promoting sports in the state. We hope the selection of Swarnalata Dalai will further encourage the youngsters of Odisha," said Manikanta Naik, Chief Resident Executive, Tata Steel, Bhubaneswar. In September 2017, Nepal had said it will measure Mount Everest afresh to settle a controversy over height of the world's tallest peak, especially after some estimates suggested it became a little shorter in the wake of an earthquake two years ago. Nepal, home to Mount Everest and half of the world's 14 highest mountains, has never measured the peak on its own and uses its snow height of 8,848 metres (29,028 feet) that was measured by the Survey of India in 1954. Many Western climbers use the height of 8,850 metres (29,035 feet) determined in 1999 by the National Geographic Society and Boston's Museum of Science, in a survey that used satellite-based technology to measure the peak.